NEW YORK (AdAge.com) — Jay Leno has long been “the King of Late Night.” Yet when he returns to his familiar roost tonight, he may find the kingdom has grown shabbier in his absence. Advertisers have already noticed. But even before that experiment began, late night was changing with a proliferation of shows and hosts, and its potential rewards were becoming a little duller. In fact, focusing on whether or not Mr. Leno can emerge triumphant is almost beside the point. Marketing spending late at night has already gotten less blunt and more “surgical,” said Jason Maltby, president-co-executive director, national broadcast, at WPP’s Mindshare. “If you’re trying to be broad, it’s not enough any more just to do the broadcast guys,” he said. “You do that and you’re missing a pretty significant percentage of the audience.” And if a marketer is seeking to reach young men in particular, he added, it needs to consider buying late-night cable. So what is late-night TV now, in an era when viewers need not stay up ’til midnight to see clever antics and topical humour because YouTube, Hulu and company carry much of the stuff on demand? Yes, the genre still has big guns like David Letterman and, presumably, Mr. Leno. 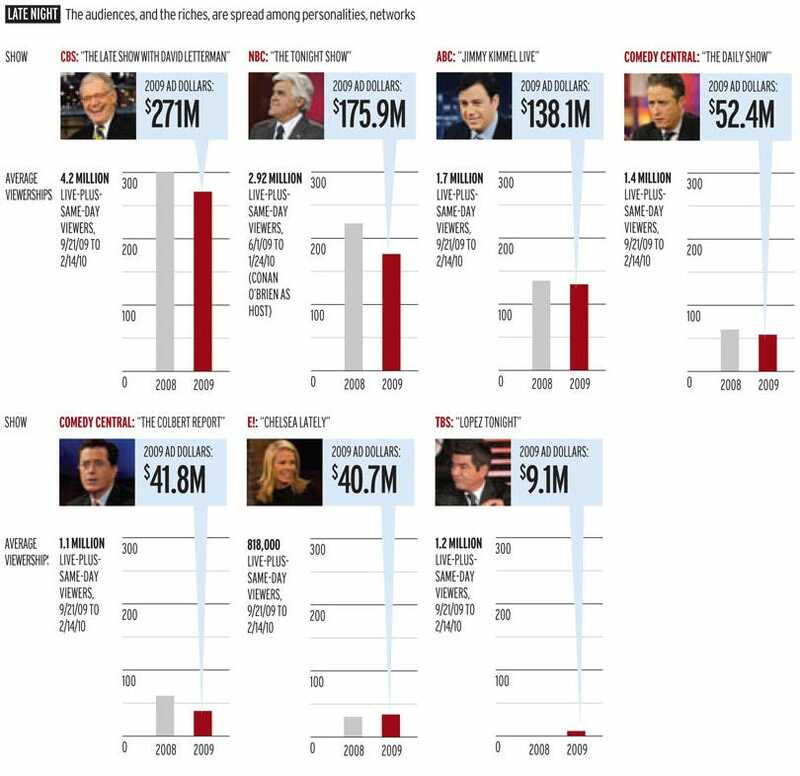 But there are a host of upstarts and rivals who also have their fingers in a wide-ranging pie. And yes, some late-night TV remains a place where viewers can, as “Tonight” creator Pat Weaver once envisioned, drift off to sleep while digesting light entertainment meant to relax, not anger. But there is also a growing cacophony of voices, each trying to outdo the others with outrageous viral video, snarky commentary and “gotcha” moments spent with celebrity guests. The genre once looked like a large empire — one host, Johnny Carson, reigned unperturbed while challengers such as Joan Rivers, Chevy Chase and the Wilton North Report folded quickly or didn’t last. Now it has devolved into a circle of smaller fiefdoms. 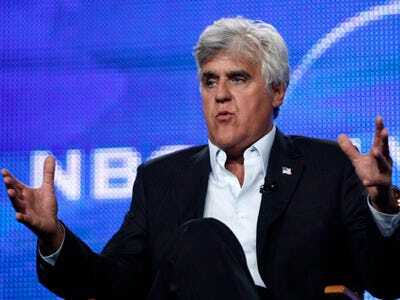 If you like broad humour, Mr. Leno may well be your guy. In his last season of “Tonight,” he lured an average of 5.1 million viewers, according to Nielsen. Then there’s the fascinating case study of Mr. Letterman, a celebrity who has nothing to prove and airs his dirty laundry in public while retaining fans and maintaining an underdog mentality, snatching an average of about 4.2 million viewers season-to-date as of Feb. 14. There’s also Jimmy Fallon, the newbie, worth an average of about 1.4 million viewers; Jimmy Kimmel, the frat boy, good for an average of about 1.7 million; and Craig Ferguson, the distinguished monologist, with average viewership around 1.9 million. How does that all compare with the old days? Even in his last season, Mr. Carson was attracting an average of 6.7 million viewers. The late-night pie could be divided further if Conan O’Brien gets back in the mix. Speculation has the lanky comedian, who parted ways with NBC earlier this year after the network moved to bring Mr. Leno back to late-night, landing at News Corp.’s Fox. And indeed, his sensibility and humour would seem to fit with that network, which specialises in snaring young, male audiences. But the economics of such a pact would be complex. Would affiliates want to give up late-night ad inventory they now control with proven syndicated fare, such as “Family Guy,” in exchange for a smaller amount of ad time during a new show from Mr. O’Brien? Would News Corp.’s 20th Century Fox studio, which syndicates some of those popular late-night selections, take a hit if local stations signed up for a new O’Brien program? And would a new show with Mr. O’Brien launch successfully given the fact that Fox would likely have to fight for clearance market by market? Mr. O’Brien is free to appear on TV this fall, but launching a new show on Fox in full could take more than a year. Meantime, late-night has had to accommodate new viewing patterns. Not only do many hosts and assorted sidekicks do live commercials — a nod to both the genre’s earliest days and present economic pressures — but they’ve had to nip and tuck their program segments to accommodate more ad time in the earlier part of their shows. Indeed, ABC and CBS have acknowledged that they moved certain ad breaks on “Jimmy Kimmel Live” and “The Late Show With David Letterman” forward so they would air before midnight — the better to reach the larger portion of the shows’ audiences and get better ratings for commercial breaks. That’s because of a late-night fact that hasn’t changed: A significant part of the audience is still turning the TV off by midnight. If Johnny Carson couldn’t beat the Sandman, the new late night isn’t going to do it now.